Shah Rukh Khan and Salman Khan. Mumbai: The year has almost come to an end which also marks the beginning of the awards show season. While past one year has given us spectacular films like ‘Neerja’, ‘Pink’, ‘Udta Punjab’ and ‘Airlift’ to name a few, some movies were plain lame and cringe-worthy. If the year got us high on cinematic experiences, it hit a real low when it came to love in Tinsel town. Lovers separated and marriages came crashing down. Overall, 2016 has been a phenomenal year for the film fraternity and its audience. But the greatest highlight of the year will be superstars SRK and Salman Khan hosting an awards show together. 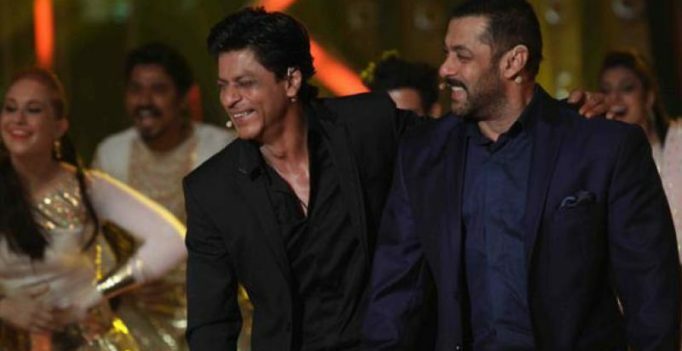 A well-placed source tells us that Bhai and SRK are going to host the popular Star Screen Awards. SRKs quirky ways and contagious sense of humour and Salman Khan’s unique personality, deadly combination. The two were spotted partying at Salman’s residence on November 28. Salman Khan has even unveiled the first look of Anushka Sharma and SRK’s next film on social media.